Our new social-media driven lifestyles have a lot of benefits: We get to know immediately which celebrities are dating, what our friends are wearing to the party tonight and which cats are the funniest. Mixed in with this deluge of “thoroughly useful information” though, are tangible benefits like social media coupons. The coupon campaigns you can run are almost limitless – and that can sometimes be a bit of a challenge. To help you get the creative juices flowing (or just give you a great campaign to replicate), we’ve compiled some of our favorite Twitter coupon campaign examples. About the Business: Gorjana & Griffin is a socially conscious lifestyle company that makes fashionable, high quality accessories for men and women. The brand has just under 6,000 Twitter followers. Exclusivity – By offering the “secret” discount exclusively to their Twitter audience (they didn’t even post it to other platforms), Gorjana and Griffin rewarded their Twitter followers. Coupon Code – The coupon code “Secret” is perfect for this campaign. Along with the question “Can you keep one?” Gorjana and Griffin were almost subliminally calling for people NOT to keep it a secret. Include a Photo – Posts that include an expanded photo are more eye catching and increase clicks, retweets and favorites. Evoke a Sense of Urgency – If Gorjana and Griffin had included a “limited time offer” or otherwise defined the timeframe on this coupon offer, people would have felt an increased sense of urgency to act quickly. Rignite is a software solution that makes it easy to run and track coupon campaigns on social media. About the Business: A repeat-visitor to our “Best Coupon Campaign” series, Bonobos caters to men who are looking for well-crafted and great-fitting clothing. They’ve built a twitter following that comes in at over 42.5k. Variety – If Bonobos had offered a discount on just one item, they would have limited the attractiveness of their offer. Instead, by offering a variety of discounts throughout the one-day campaign, they increased their opportunity to drive sales. Series – By creating a series, rather than offering a single coupon, Bonobos strengthened their campaign by broadening the appeal to a variety of products. Hashtag – Bonobos’ use of the hashtag #CyberMonday (instead of inventing their own) guaranteed that they would show up in searches during the busiest online shopping day of the year. Coupon Code – The coupon code “CYBER30” connected the coupon campaign to the hashtag/event. By keeping the code consistent throughout the variety of offers, Bonobos kept the campaign simple for their potential customers. Use Images – Stop us if you’ve heard this before, but Bonobos’ tweets would have been stronger if they would have had an attached photo. 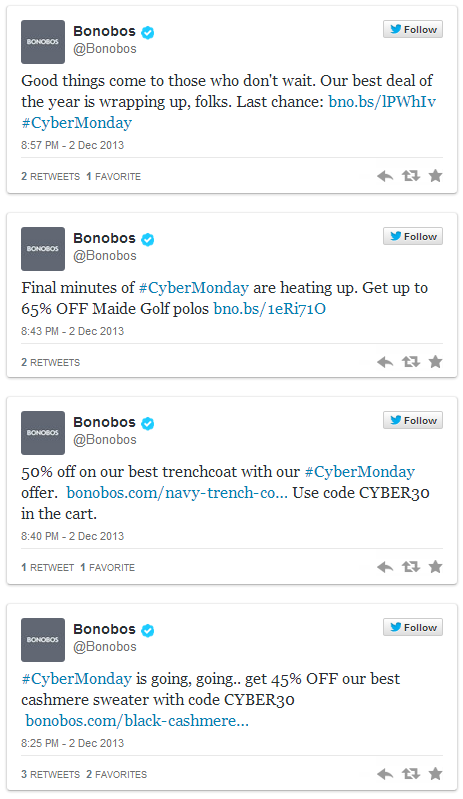 Cross Promotion – Bonobos could have strengthened their campaign by extending the posts to their Facebook and Instagram following. Incentivize sharing – Bonobos could have reached an even larger audience if they had set “retweet thresholds” to increase the discount. For example, they could have started the campaign at a 20% discount, but then increased it by 5% for every 100 retweets they got on the posts. About the Business: An online retailer specializing in vintage, vintage-inspired and indie clothing, ModCloth has over 127,000 followers on Twitter. 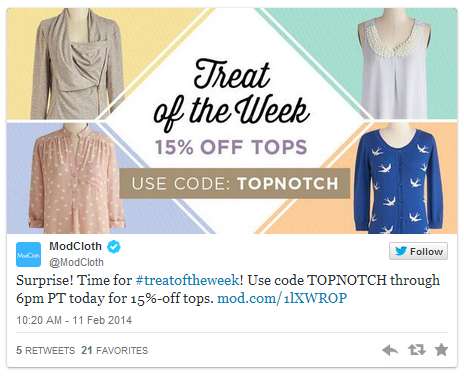 About the Campaign: ModCloth ran a surprise coupon code for their Twitter and Facebook followers offering 15% off of all tops. Surprise & Delight – The way the coupon is described as #treatoftheweek, the idea is planted that the excitement of the surprise is just one of many future surprises to come. That’s in addition to the reward this campaign is already giving. Sense of Urgency – The limited-time nature of the discount urged people to act quickly on impulse instead of waiting, which often leads to the loss of a sale. Post Quality – The coupon campaign was clearly communicated and the image was uniform across Twitter and Facebook. Schedule a Series of Posts – Given the coupon was available for only one day, ModCloth could have scheduled a post every hour to ensure they show up in their followers’ feeds at different times of the day. Each post could have increased in urgency as expiration time neared. A compelling offer is the first, and most important step to ensuring success. Make sure you’re giving a discount that people will feel is good enough to make an impulse purchase they might otherwise have skipped. The tendency for buyers is to wait and think before making a purchase, which can lead to not making a purchase. 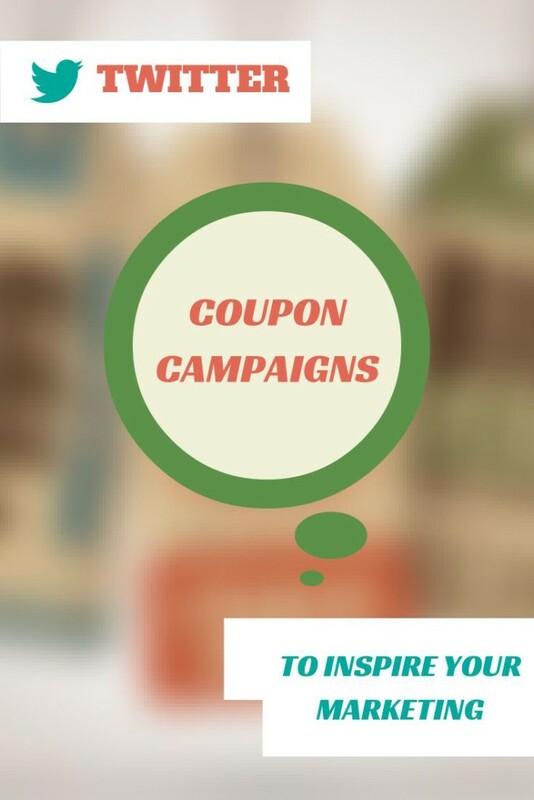 Use your coupon campaign to create a sense of urgency so they know that waiting may cost them your great discount. Make sure your prospect knows what to do next, and make it easy to buy, by including a clear call to action. If you’re going to post your coupon to multiple channels, avoid confusion by having a consistent message across all channels. You can gain a larger audience and take advantage of trends by tying your campaign to a popular hashtag, which in some cases is a current event/holiday or in others might be a trendy topic. In today’s economy, pictures are worth exactly 1,627 words, and you will gain a lot more attention for your coupon campaign by including strong visual imagery with your post. Unlike other platforms, character counts are a real concern when running a Twitter campaign. Be sure to use concise text with easy-to-follow instructions so your message isn’t cut off. Rignite is a software solution that makes it easy to run campaigns on Twitter and Facebook.